An option that will start some time in the future, where the strike price is not fully determined until an intermediate date t before maturity T.
It can be constructed as a call or a put, and can be either European or American. 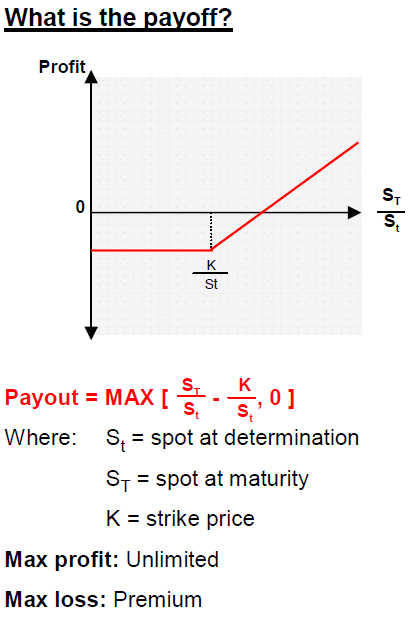 On the start date, the strike is typically the prevailing spot price (ATM), or is set to a proportion of the underlying asset price at the time of determination. The premium is paid at time zero. Enables investors to monetise growth in dividends without taking market risk. They are the building blocks to cliquet options. Cost is known although the option comes into existence only in the future. Maximum loss is the premium paid.